Christmas is finally here and it’s time to spread good cheer! Entertaining for the holidays is certainly one way to spread positive vibes and quality time with your loved ones. Invite a few friends over for a few hor d'oeuvres, a soulful Christmas playlist blasting through the speakers, and when the spirits start to flow. Whewwww chileeee, it’s NOT going to be a SILENT night! I have an 720 sq ft apartment and space is limited. When entertaining, using unnecessary counter space other than food is a NO NO. Therefore, I rely on my handy dandy bar cart. The bar cart is perfect for displaying spirits, beverages, garnish, and barware all in one spot! If your friends are anything like my friends, the bar cart is the highlight of the night! So, why not jazz it up and let it have it’s moment for the night. Below are a few tips to the perfect “holla” day bar cart for entertaining in STYLE. Add Petite tree+ornaments: 2ft size tree will serve it’s purpose on this bar cart and don’t forget a few cute colored ornaments. Add Spirits: the more the merrier, right? There is “no cap” to the amount of alcohol that should be on your cart. Let your guest pour their own troubles and enjoy their night. FYI: just make sure they Uber/Lyft home. 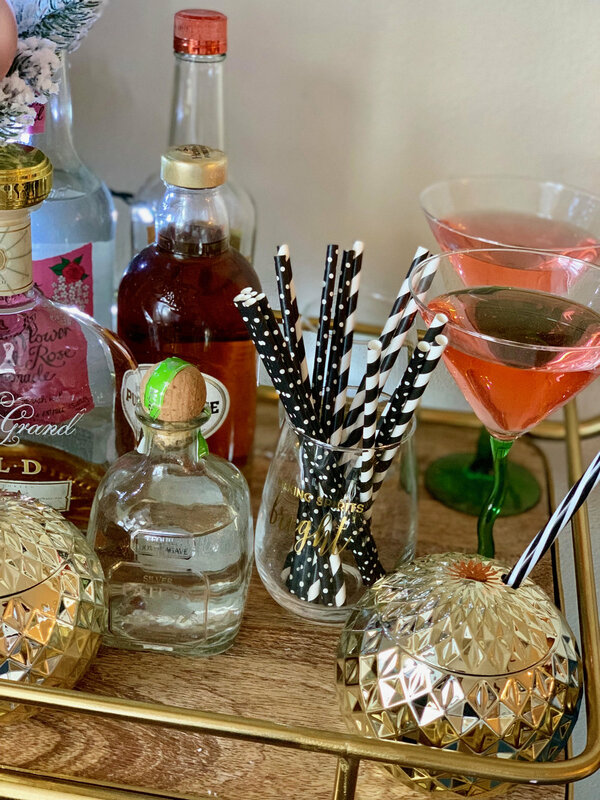 Add Holiday Accessories: adorn your bar cart with fun holiday accessories. Deer figurines, stockings, garland, ANYTHING FESTIVE. I found these cool disco balls, which mimics Christmas ornaments at my local AtHome (isn’t it cute)? Wall Decor: for added character and appeal. You can add a little flava to your display by bringing in cool wall decor. It’s Lit: don’t forget to turn on the lights on your tree, accompanied with a soulful Christmas playlist. Remember, the key here is to find fun FESTIVE holiday decor pieces and display whatever you love to drink on your bar cart. And you will be entertaining in style! Stay tuned next week, for more “holla” day styling tips!